These sturdy, heavy-duty, powder-coated units have a variety of outdoor uses and are often found in builder’s yards, on building sites or around garden centre areas. They are ideal for navigating uneven or rough surfaces, and their robust construction will mean they can conquer any environment, even whilst carrying a heavy load. 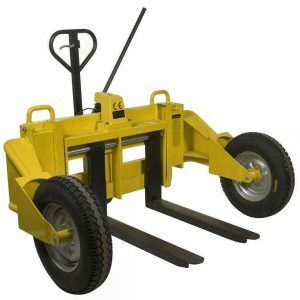 Rough terrain pallet trucks like this one are heavy lifters – this model can lift 1.2 tonnes using a manually operating hydraulic pump and handle. 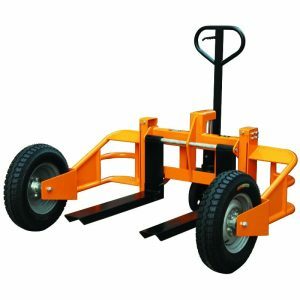 With 860mm long forks which are compatible with many standard pallet sizes, as well as pneumatic tires which ensure fragile or delicate products can be moved over the toughest terrain without any damage, they are a must-have for many working in outdoor areas. Check out the specification and full details of the RTT12 rough terrain pallet truck online, or call one of our sales team for further details on 0845 519 2700.